I was curious about two things: what the question was and who it was that it angered. At the beginning, the author introduces us to Hugh, he’s back home from a mission, he’s now an Ex-Military officer and he’s surviving on pension from the government and is difficult to be around because he’s never sober and he doesn’t open much to his therapists and family. So, he is pretty much a jerk, up until his brother Nick, a teacher, gets him to meet the parents of nineteen year old Jack who went backpacking in Thailand and so far is missing. They ask him to go in search of Jack and offer to pay him more than he’s getting or making-and the next thing he knows, he’s on a plane to Thailand to bring Jack home. The plot thickens and you cannot help but be on the edge of your seat as Hugh finds that he’s immersed in a dangerous world and finding Jack might lead to either death or never making it out of where they are. He’s also got his own issues to deal with and drowning in alcohol or getting high doesn’t seem to get him there. What I loved about this book is that Hugh is not your dashing knight in armor. He’s a pain, pessimistic, rude, self-absorbed but he’s also afraid, hurting, guilty and when this other side of him is revealed, you cannot help but empathize with him. There’s a man in one of the bars in Bangkok who asked him “Yes. You will find him. But will you save him?” This was the one question that ran through my mind until I finished the book. The story has a great flow, the action of each character adds to the thrill and perhaps, the one man, whom Hugh was so afraid of, is the one who helped him reach a turning point and that there is what made this story intense. I’ve got to give a huge shout-out to Thistle Publishing for sending me an eARC to read and review. It sure did provide an insight to both the day and nightlife of Thailand and was such a great read. Fans of Mysteries, Thrillers and Crime are going to devour this. Reviewed also on: Goodreads and Amazon. Get the book: On Amazon today, click here. About the author: Born in 1987, Christopher Bardsley was raised in Melbourne, Australia. He undertook his studies at the University of Melbourne, where he received a Bachelor of Arts and Master of Education. In 2012, Christopher was the recipient of Melbourne University’s Above Water prize for his short story Little Rock. He also received an honourable mention in the 2011 competition for his story Cripple Creek. Christopher has also published poetry and cultural criticism through Farrago magazine. 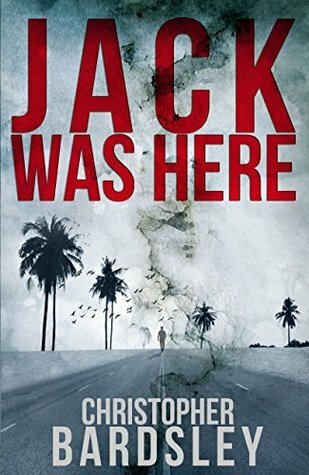 This entry was posted in Book Reviews and tagged Book Reviews, christopher bardsley, crime and mystery books, jack was here, thrillers to read this year by nilichosomablog. Bookmark the permalink.